3-arm universal puller for removing bearings, gears, washers, etc. leg length 100mm maximum pulling diameter 90mm. In any position, even under full load, parallel jaws. Steplessly movable jaws on the crossbar. Optimal adjustment of the spindle to the shaft by 2-sided spindle tip (ball and tip). Optionally convertible to different types of puller hooks and variable reach through jaw extensions. Can be used as an external and internal puller by turning the jaws off. Also suitable for stripping asymmetrical workpieces. The collar of the spindle head prevents the key from slipping off. Almost all components available as spare parts, time-saving ordering by numbering. Hydraulic Spindle Series 8 -0 for particularly tight parts optionally available from a certain puller size. Hydraulic additional press series 9 for particularly tight parts optionally applicable from a certain puller size. Note: Series 600-17 plungers are a good complement if the shaft is hollow and spindle support is not possible. Rolled thread is specially coated. The three-arm guarantees even load distribution and thus a particularly secure grip on the part to be withdrawn. 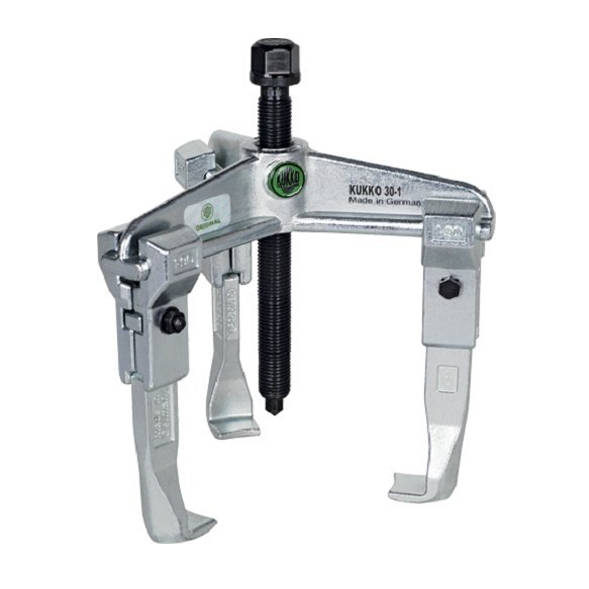 If there is not enough free space around the part to be removed, we recommend a 2-arm puller series 20. The part to be deducted, eg a toothed wheel, a pulley or a ball bearing is gripped from the outside. By tightening the spindle and the resulting pressure, the deducted part is released from the shaft. For central shafts, the puller must be centered. If the shaft is not centered, it can also be removed asymmetrically with pullers with parallel jaws. The slides of the jaws must always be completely and firmly seated on the crossbar. For several parts to be removed, always remove gradually. Never remove several parts at the same time. The bearing surfaces of the jaws must be completely and just below the part to be pulled off. Do not use electric or pneumatic power or impact wrenches.